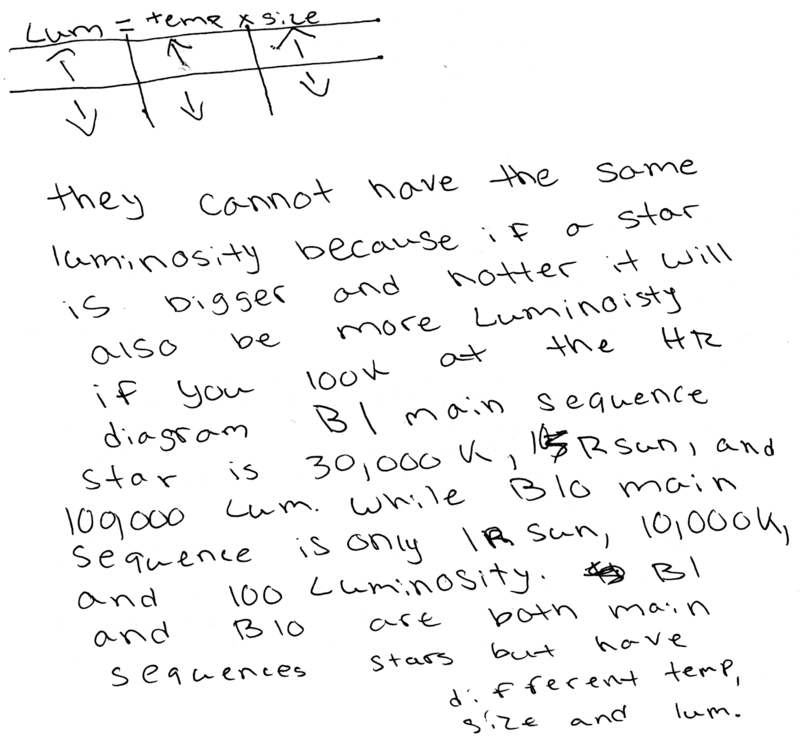 Srr: Is it possible for two main-sequence stars to have different temperatures and different sizes but the same luminosity? Rgr: No, because more massive main-sequence stars are hotter and larger than the lesser massive main-sequence stars, they cannot have the same luminosity. 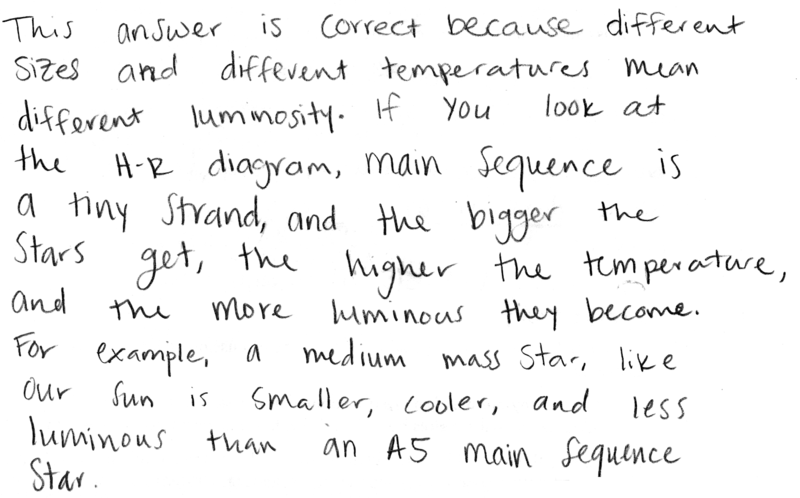 Discuss why this answer is correct for main-sequence stars, and how you know this. Explain using Wien's law, the Stefan-Boltzmann law and/or an H-R diagram. Correct. Discusses how the Stefan-Boltzmann law and/or H-R diagram shows that along the main-sequence, the more-massive stars will be located in the hotter, larger, brighter upper left-hand corner, while the less-massive stars will be located in the cooler, smaller, dimmer lower right-hand corner, so they cannot have the same luminosity. Nearly correct (explanation weak, unclear or only nearly complete); includes extraneous/tangential information; or has minor errors. May have compared two stars in general, rather than explicitly comparing two stars on the main-sequence line. Contains right ideas, but discussion is unclear/incomplete or contains major errors. At least discussion demonstrates understanding of Wien's law, H-R diagram and/or the Stefan-Boltzmann law. Limited relevant discussion of supporting evidence of at least some merit, but in an inconsistent or unclear manner. At least attempts to use Wien's law, H-R diagram and/or the Stefan-Boltzmann law. Implementation/application of ideas, but credit given for effort rather than merit. Discussion not based on Wien's law, H-R diagram and/or the Stefan-Boltzmann law.